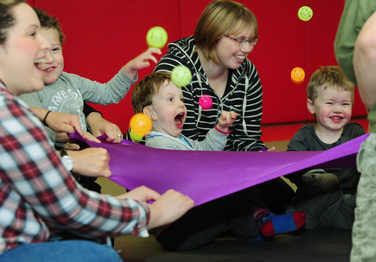 To provide regular specialised music groups for children who need extra help with communication and social skills. To introduce the children to various musical concepts, styles, vocal and playing skills, and to the music of different cultures. To help the children gain confidence as well as social and communication skills, at their own pace and in a community setting, by engaging them in musical activities. To complement and work in partnership with other services involved with the children such as speech and language therapy, pre-school educational support, school and nursery staff, in order to enable each child to fulfil his or her potential. ...and to have fun while achieving our aims! One of our parents said: "Access to SS&S meant my little boy was able to attend mainstream school with his peers." "The routines, the sitting and concentrating and facilitating his communication with signing meant he already had key skills required for school." To read more from our parents click on 'quotes'.